Mike Constable is a Cal Poly graduate who soon begins training with the Air National Guard as a pilot to fly transport planes. 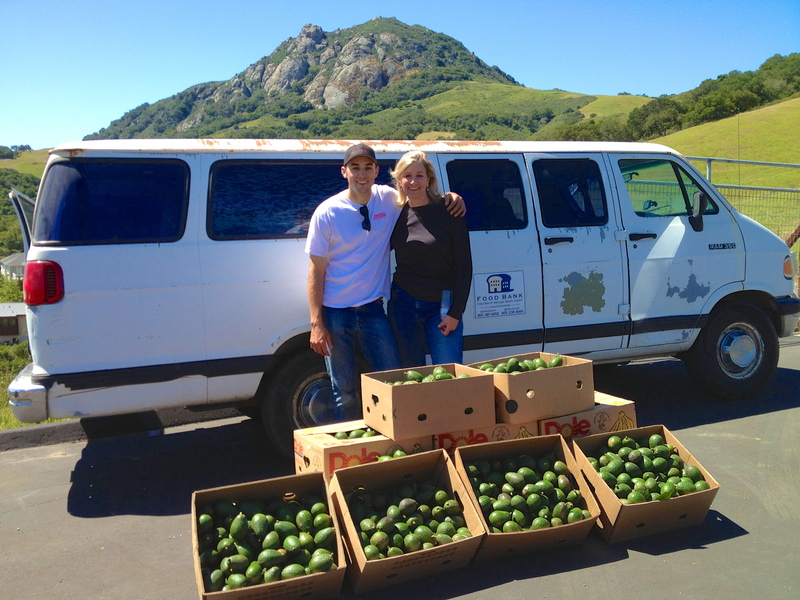 Since early 2013, Mike has volunteered with GleanSLO, bringing enthusiasm, a great attitude and muscle! This year he chose to become a Neighborhood Harvest Leader and lead his own local gleans. 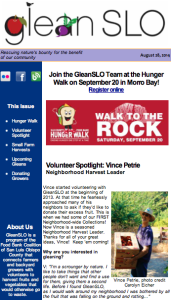 We are pleased to share an interview with Mike here and want to thank him for his energy and dedication to GleanSLO! I’ve enjoyed the awesomeness the central coast has to offer over the last six years. During and after school at Cal Poly, I worked at the San Luis Obispo Airport. As a Line Service Technician I fueled planes and aided arrivals/departures. I graduated from Cal Poly with a degree in Construction Management and continued to pursue my dream of flying. I was selected to attend Air Force Pilot Training and I’m currently awaiting training to begin later this fall. GS: How did you find out about GleanSLO? I actually just googled ‘San Luis Obispo Volunteering’ and stumbled across the GleanSLO webpage which worked very well at organizing gleans. GS: What is your favorite part of gleaning? I have two favorite parts. 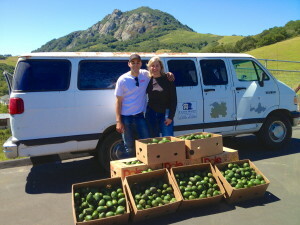 First, driving out to glean spectacular farms/locations on the central coast. The scenery around these farms is truly remarkable. Second, dropping off gleaned food to charities, agencies and food pantries. The smiles and thank you’s we received from distributors of gleaned food really made me feel like I helped someone out. It’s cool to see the ‘fruit’ of our labor. GS: Any memorable stories/farms/connections you’ve made through GleanSLO? Getting recognized multiple times as a ‘gleaner’ at the grocery store always gave me a chuckle. I also had fun getting to know the other volunteers. Regardless of age or background, our common interests always insured we were volunteering among friends. I remember showing up late to my first glean at an orange orchard in Nipomo due to a dead car battery. From then on I was hooked and much more punctual. This entry was posted in GleanSLO Interviews on 09/25/2014 by gleanslo. Enjoy our August 2014 edition! This entry was posted in Archived Newsletters on 09/24/2014 by gleanslo.